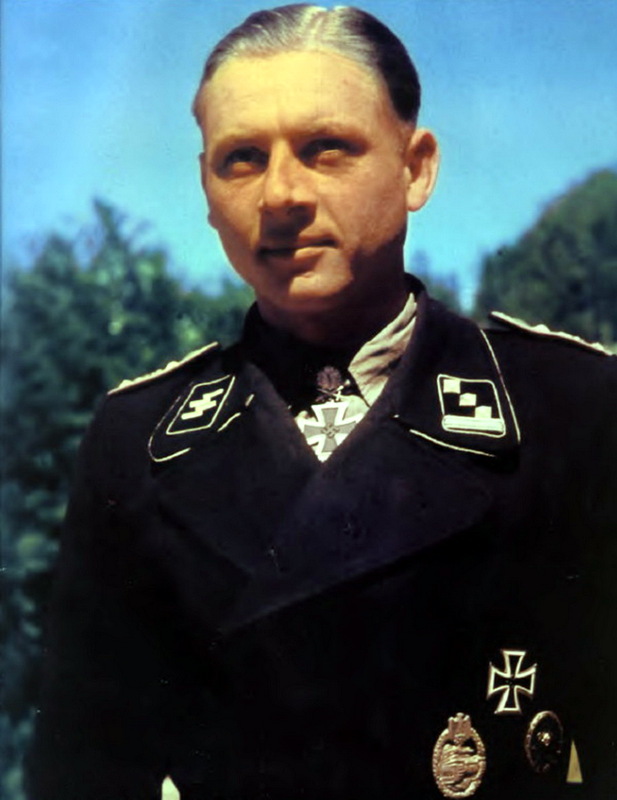 Michael Wittmann is born on 22 April, 1914 in Vogelthal, Oberplatz. On 1 February, 1934, Wittmann steps into the Reichsarbeitdienst where he works for six months. On 30 October of the same year he volunteers for the German army, at 10.Kompanie / III.Bataillon / Infanterie-Regiment 19. On 30 September 1936 he leaves the service as Unteroffizier. On 5 April, 1937 Wittmann assigns to the 1.Sturm / 92.Standarte / Leibstandarte SS Adolf Hitler (LSSAH). Later in the year he starts training on a light four wheel armoured car, the Sd.Kfz.222, before he goes for the six wheeled Sd.Kfz.232. Wittmann gets an assignment with the Panzer reconnaissance unit in the LSSAH. In September 1939 war starts for SS-Unterscharführer Wittmann when he is commander of the reconnaissance unit that is invading Poland. It is for a short while, however, because in October Wittmann starts training at the SS-Sturm-Batterie of the LSSAH with the Sturmgeschutz Ausf A. In the fall of 1940 the Panzer career of Wittmann starts in Yugoslavia and Greece. Here he gets his own command over a platoon of Sturmgeschutz III Ausf A. On 11 June 1941 the LSSAH and Wittmann leaves for the east, to prepare for Operation Barbarossa, which would start on 22 June. In July Wittmann receives the Eisernes Kreuz II.Klasse when he destroyed six Russian tanks. When he is wounded he refuses to leave his unit. On 8 September of the same year he receives the Eisernes Kreuz I.Klasse when he destroyed another six Russian tanks during one fight near Rostov. He is promoted to SS-Oberscharführer. 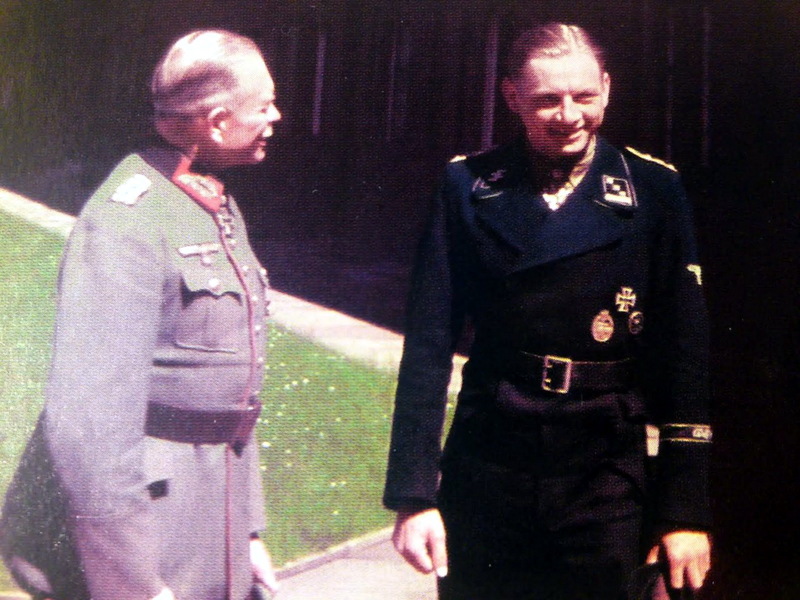 Because of his great achievements, Wittmann is granted a officers education in June 1942. On 5 September of the same year he leaves the school as a Panzer instructor (SS-Panzerausbildungs und Ersatz-Abteilung). In the fall of 1942, the status of LSSAH is graded up to a Panzergrenadier Division. With the addition of 13. Kompanie, which is equipped with the PzKpfw VI Tiger. On 21 December Wittmann is promoted to SS-Untersturmführer and becomes a platoon commander with 13. Kompanie where he gets a platoon Panzer III Ausf L/M which operates beside the Tiger company. After training, the LSSAH leaves in January, 1943 for the East front. In the spring Wttmann finally gets his own Tiger I in 13. Kompanie. On 5 July, 1943 Wittmann destroyed during Operation Zitadelle 13 T-34 tanks and 2 anti-tank guns. A couple of days later, on 7 and 8 July, he destroyed another 7 Russian tanks (2 T-34, 2 SU-122 and 3 T-60/70 tanks). On 12 July he destroys 8 Russian tanks plus 3 anti-tank guns and a fieldbattery. When the operation comes to a closure on 17 July, Wittmann's score is 30 Russian tanks and 28 guns. On 29 July, 1943 the 13 Kompanie is reformed to become the Schwere SS Panzer Abteilung 101 which is connected to the LSSAH. In August the LSSAH is deployed to Italy. In October the SS-Panzergrenadier-Division LSSAH becomes the 1. SS-Panzer-Division LSSAH. In the same month, the division leaves again for Russia. On 13 October, Wittmann scores 20 T-34 tanks and 23 other cannons. On 13 January, 1944 Michael Wittmann receives the Ritterkreuz (Knights Cross) for his devotion. According to the propaganda machine, that announces it over the radio, Wittmann's score was then; 88 tanks and selfpropelled guns destroyed. A couple of days later, his gunner, SS-Rottenfuhrer Balthasar (Bobby) Woll, receives the Eisernes Kreuz I.Klasse for his great marksmanship, even when the tanks is in motion! On 20 January 1944 Wittmann is promoted to SS-Obersturmfuhrer. Two weeks later, on 30 January, Wittmann receives a telegram from Hitler with the announcement, that he had become the 380th German soldier, who gets the Eichenlaub to the Ritterkreuz des Eisernen Kreuzes. On 20 February he receives the additions, in the Wolfsschanze, from Hitler himself. From 29 February till 2 March 1944, the largest portion of the company is moved to Mons, Belgium. Around this period, Wittmann gets the command over 2.Kompanie / sSSPzAbt 101 / LSSAH. 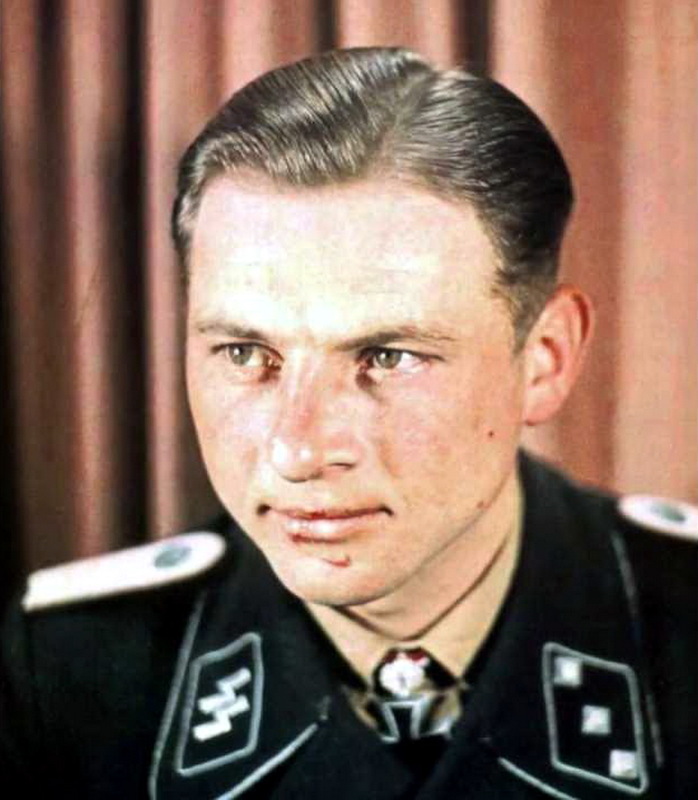 On 2 March Michael Wittmann marries Hildegard Burmester, witness is Bobby Woll. Meanwhile Wittmann becomes a hero to the German people through an extensive propaganda. In April he visits the Henschel und Sohn factory in Kassel where the Tiger I is produced. Here he is shown the latest version of it, the Ausf. E. In May, Wittmann returns with to his sSSPzAbt 101, LSSAH. These are then stationed near Lisieux in Normandy. Around this time, Bobby Woll, his faithful gunner, is given his own command over a Tiger I (de ‘335’). He would fight in Normandy and get wounded near Bayeux after an attack of fighterbombers. Woll would see action again during the Battle of the Bulge, end of 1944, in a Tiger II (Woll passed away in 1996). During the invasion on 6 June 1944, the Schwere SS-Panzer-Abteilung 101 were a reserve unit connected to the Panzer Lehr Division (which had also the command over the 12. SS Panzer Division ‘Hitler Jugend’). 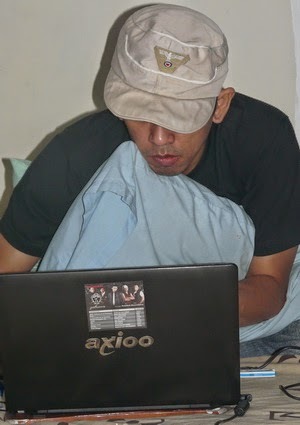 sSSPzAbt 101 was at that moment under command of Heinz von Westernhagen (Tiger ‘007’). Commander of 1. Kompanie was SS-Haubtsturmführer Rolf Möbius, of 2. 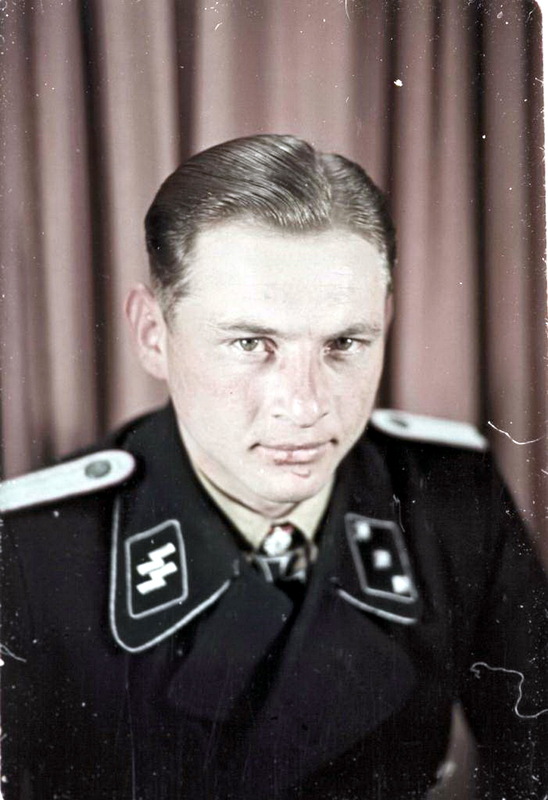 Kompanie SS-Obersturmführer Michael Wittmann and of 3. Kompanie, SS-Obersturmführer Hanno Raasch was the commander. On 6 June (D-Day) Wittmann received a new Tiger, the ‘205’ in which he moved of towards the front. During the deployment he lost six of his original twelve Tiger tanks that were under his command in 2. Kompanie. This was due to Allied fighter bombers and technical failure of the tanks. On 12 June, they went into a bivouac for the night, north-east of Villers-Bocage. The next day, Wittmann went definitely into the history books. On 13th June 1944, a week after D-day, following a drive from Beauvais under repeated air attack, 2. Kompanie of sSSPzAbt 101 led by Michael Wittmann had 6 Tigers located in the area of Hill (Point) 213 ahove Villers Bocage. His orders were to stop the advance of the 22nd Armored Brigade of the British 7th Armored Division (the famous ‘Desert Rats’) from advancing through the township, outflanking the German line and gaining the road to Caen. Wittmann’s company hidden behind a hedgerow spotted the enemy column, which passed him at a distance of 200 meters. At about 8:00am, Wittmann attacked the British column on the main road, while the rest of his company (4 Tigers as one brokedown) attacked the British forces around Hill 213. Soon after, Wittmann destroyed Sherman Firefly and Cromwell IV and headed south to attack the rest of the enemy transport column. After knocking out 8 half-tracks, 4 Bren Carriers and 2 6 pdr anti-tank guns, Wittmann reached the crossroad with the road to Tilly-sur-Seulles. At the crossroad, he destroyed 3 Stuart tanks from recon unit and reached the outskirts of the town of Villers-Bocage. While in town, Wittmann destroyed 4 Cromwell IV tanks and single half-track and turns into Rue Pasteur. Following up the street, he knocked out Cromwell IV and Sherman OP tank, reaching the main street of Villers-Bocage. At the end of Rue Pasteur, Wittmann’s Tiger was hit by Sherman Firefly from B Squadron and he decided to turn back as being too far forward without any infantry support and in a build-up area. He turned in the direction of Caen to join the rest of his company. On his way back, Wittmann’s Tiger was attacked by another Cromwell IV, which he destroyed as well. Back at the Tilly crossroad, British soldiers from 1st Rifle Brigade opened fire at Wittmann with their 6 pdr anti-tank gun, immobilizing his Tiger. Wittmann and his crew managed to escape on foot towards the Panzer Lehr positions 7km away near Orbois. The rest of his company at the Hill 213, destroyed the rest of the A Squadron of 4th County of London Yeomanry Regiment ("Sharpshooters") including 5 Cromwell IV and Sherman Firefly, while capturing 30 men. During this short engagement, Wittmann’s company destroyed 4 Sherman Firefly, 20 Cromwell, 3 Stuart, 3 M4 Sherman OP, 14 half-tracks, 16 Bren Carriers and 2 6 pdr anti-tank guns. Wittmann’s attack was followed by another one by Tigers of Hauptsturmfuehrer Rolf Moebius’ 1st Kompanie of sSSPzAbt 101 and Panzerkampfwagen IV tanks from Panzer Lehr but was repulsed by anti-tank guns from 22nd Armored Brigade. Following day, British withdrew from the town leaving it to the Germans, who occupied it for next two months. The British drive on Villers Bocage and Caen was stopped cold by Wittmann’s attack and following actions! 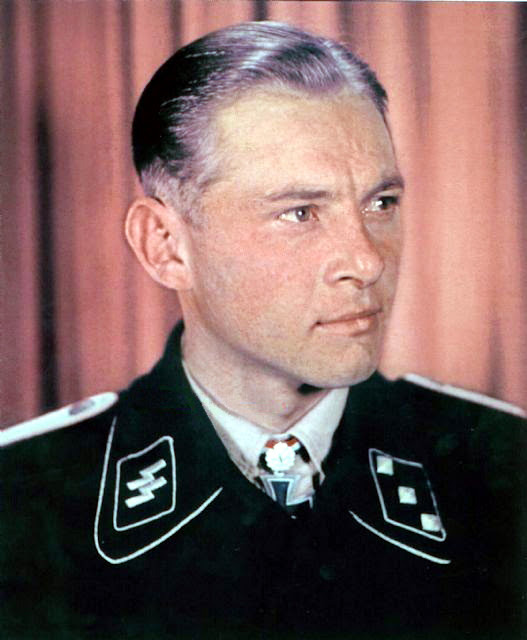 On 22 June, 1944, after the success in Villers-Bocage, Wittmann received the Swords to his Knights Cross with Oakleaves (after recommendation of the commander of Panzer Lehr, Generalleutnant Fritz Bayerlein), from the hands of SS-Obergruppenfuhrer und Panzergeneral der Waffen SS Josef ‘Sepp’ Dietrich, commander of the LSSAH. On 25 June the ceremony was repeated, when Wittmann received the same Swords from Hitler. With these, Wittmann became the most decorated tanker of the Second World War! He also was promoted to SS-Haupsturmfuhrer. Wittmann was given the post of instructor, but he choose the front instead of a school, and went back to Normandy. During the month of July, 1944 he fought in the Battle for Caen. Early August, Wittmann received as Abteilungskommandant, again a new Tiger I, the ‘007’ in which he operates on 8 August in the area of Cintheaux. At 12.55 hours, the Tiger from Wittmann is hit in a field next to the road of Caen- Cintheaux, near Gaumesnil. The explosion blows the turret clean of the hull and all of the crew is killed. After the fighting, the bodies are buried in a pit next to the remnants of Tiger ‘007’. In March 1983, while working on the new N 158, human remains are found. After research it is concluded that these belonged to Wittmann and his crew. For years it was uncertain where the body of Wittmann was buried. Also was unclear what the cause for the destruction was of ‘007’. One of the options was that the Tiger was destroyed by a rocket from a fighterbomber. After investigation by Serge Varin, who had found ‘007’, he concluded that it was struck by a HE rocket from a RAF Typhoon. He did not find penetration holes of grenades, but there was just one big hole in the thin (25mm) engine top cover. On 8 August Typhoons where responsible for the destruction of 135 German tanks. But there were also different tank units which claimed the destruction of ‘007’, such as the 1st Polish Armoured Division and the 4th Canadian Armoured Division. Today, most accepted opinion is that Wittmann and his crew were killed from a shot of a Sherman Vc Firefly, from 3 Troop, A Squadron, Northamptonshire Yeomanry. This Firefly, the ‘Velikye Luki’, under command of Sergeant Gordon was operating with other Fireflies when they encountered three Tigers. They fired on these Tigers which were all three destroyed in a couple of minutes. The first Tiger was destroyed at 12.40 hours and the second, which returned fire, exploded at 12.47 hours. The third Tiger, probably the ‘007’, was put out of action with two shells, fired by gunner Trooper Joe Ekins from the Firefly of Sergeant Gordon. This was written down in the official daily journal of A Squadron. After the remains were found of Wittmann and his crew, they were reburied at the German war cemetery at La Cambe, where it is attracting many visitors. Unfortunately there are people who think it is necessary to bring extreme right wing and fascistic items to their grave. Wittmann was an SS (he was known as a fanatic ‘heel clicker’) and fought for a rotten regime. But his heroism may in that context not be forgotten. He was very popular among his comrades and showed sometimes, during the dirty fighting at the Eastern front, his human side. One day, crewmembers who jumped burning from their destroyed T-34 had their flames put out by blankets from Wittmann and his crew and were handed over to the medical service. But Wittmann was a cold blooded tanker who seemed unstoppable and which was ultimate leading to his death. The German cemetery at La Cambe can be found on the N 13 (global central between Bayeux and Carentan). Wittmann and his crew are buried in lot 47, row 3 and grave 120. The total score of victories for Wittmann till 8 August, 1944 was 141 tanks and 132 anti-tank guns. Most of these victories were made on the Eastern front. Ekins Fired only one shot at Wittmann's tank which immediately 'blew up' 314 (the first Tiger) was hit twice by Ekins because his first hit showed no effect but the second hit caused the tiger to 'burn'. The third and last Tiger Ekins engaged was 009 which was seen to be 'milling about'. Ekins again had to fire two round into this tiger before it burned. Ekins fired 6 rounds during the day, knocking out 3 tigers and one Pz.IV type from 1,200 yards. he knocked out the three tigers from left to right. Ekins firefly also retired into cover of the orchard between engagements.